This veteran law enforcement detective suffered a massive back injury less than a year ago. See what he did to put the injury behind him and recover better than ever! I'm a 15-year police officer/detective veteran in Erie, Pennsylvania, who suffered a horrible back injury last year that required surgery. My recovery was long and is still ongoing. I thought my lifting and time in the gym was over. Slowly, I began to feel some sensation in my right leg which suffered nerve atrophy. To make things worse, I was diagnosed with neuropathy. The nerves in my legs don't power at full strength. With this new knowledge, I was bound and determined to keep trying. I went back to the gym a few months after my surgery and felt like a child. I lifted slowly and light, became depressed at times, and wanted to throw in the towel. After thinking about it for a bit and evaluating my condition, I decided to go for it when I felt about 80 percent recovered. I currently suffer from numbness in my knee down, and weakness issues show in walking. My expectations to challenge myself mentally and physically pushed me to keep going. I put things together and told myself that training will help me heal. Nothing was going to stop me. I got in the zone. I sweat, bleed, and cried through the pain. I trained smart and gave it 110 percent. Twelve weeks later, I'm sitting here on the tail end of my diet writing this blog: "I Made It!" With this internal motivation, I can honestly say I'm now 90 percent recovered. My inspiration came from a civil servant transformation contest. I was very ill in the weeks before the contest with neuropathy and post-surgery back pain. I was pretty much giving up on training seriously. The transformation contest for civil servants came along, which made me think, "Not only do I serve the law as a police detective, but also serve myself." I decided to take the challenge on. With recovery comes healing, and training would force faster healing. I did the 12-week transformation, as you can see by my before and after photos. I lost the contest in the end, but won for myself. I decided to stay away from most supplements to keep my body clean and force recovery from back surgery. I think this was a smart move for the time being. In the future, I plan to look into pre-workout powders. I kept the rep range at 3 sets of 7-15 reps for each exercise. I trained on feel since I was recovering from back surgery. I trained heavy with low reps when I felt strong and went light with high reps to keep the load off my back on days when I didn't feel 100 percent. Due to my back injury, I performed one-leg exercises to ease the load. The diet was definitely the hardest part. Motivation and belief that training would promote healing drove me. My diet is always a go-to diet. I had a trainer write this up for me a long time ago. I modified it along the way, but it works. I trained a few others on it and they have reached incredible success. Some days, I got back pain associated from my surgery, but I learned how to relax my body and still go in and train light. I'd like to start bodybuilding again. My back does flare up during heavy legs, so I'll look to see if training for a show will be possible. I want to train middle-aged groups of people and help them transform. I like to pay it forward. I'd also like to work at a local gym or possibly open up my own to share diet and training information and promote healthy living. First, find a diet that works with you. Train for resistance. You don't have to be a power lifter to transform. Stay the course, don't give up, and be patient. Look at other similar transformations. This gives you inspiration and belief. 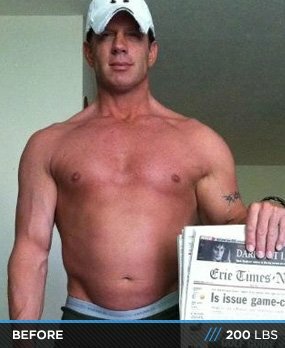 Bodybuilding.com helped me understand lifting and how to set goals. Talking with likeminded friends on Bodybuilding.com and sharing my progression was very inspirational. 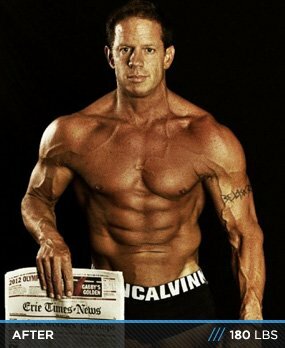 I never knew the full elements of bodybuilding until I found Bodybuilding.com. Watching motivational video series from Layne Norton and Tommy Jeffers gave me greater insight. I found my trainer from previous shows here. It's a great network of likeminded friends.